Comment and discussion on Valve Software’s digital communications platform. Valve have begun to use region restriction as a front-line selling point for Steam when promoting it to publishers. Last Friday, Valve began preventing retail copies of their Source (i.e. post-2004) games bought in Thailand and Russia from being played outside their country of origin. The internet has exploded the story in the way only the internet can, and it’s high time for some rationality. Valve have announced that the Half-Life 2 “black box” SKU will no longer be shipped, leaving PC players with either the orange box, which also contains Half-Life 2 and Episode One, or Steam, which is still set to offer a package of just the three new titles. Triton’s demise has been a particularly untimely one. 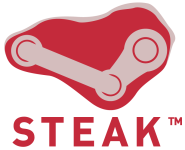 Its plug was unexpectedly pulled during Steam’s strongest single week of growth—perhaps not in coincidence. Its closure has been every digital distribution paranoiac’s nightmare come true, a case study for the worst-case scenario in fact, and as such is of great interest to anyone with a stake or interest in any connected digital distribution scheme. Mark Healey’s Rag Doll Kung Fu will be available on North American store shelves from August, through ‘developer-friendly’ independent publisher Merscom.